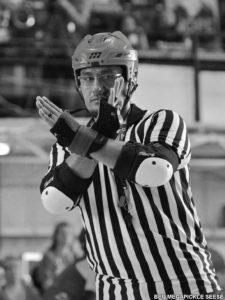 Rose City Rollers is happy to present the prestigious Gold Star Volunteer Award to Ill PresiDante (street name Dante Buccieri), an esteemed member of team Zebra. Dante has filled many roles within the league, willing to help where needed and contribute knowledge to all. He loves Rose City, roller derby, his league family, and all the amazing folks he has met along the way. Congratulations Dante, your recognition is well deserved and we here at Rose City Rollers greatly appreciate all your hard work and dedication. Officials aren’t allowed to choose favorites! But seriously, my favorite will always be Team Officials. There’s an incredible camaraderie within officiating crews, and we regard each other as teammates. We all are here to bring each other up, and support each other during great games and rough ones. There is communication, strategy, and best practice sharing, just like any other sports team. We work together, we train together, we grow together, & we succeed and fail together. Everyone here has the crew’s best interests at mind. If that’s not a team, I don’t know what is. They’ve got my back, and I have theirs. I wouldn’t trade Team Officials for anything. I’m no different than many folks who joined roller derby. I never really found a group that I fit in until I found the sport. When I moved to Portland in 2014, I knew no one but my parents. RCR officiating and RCR at large took me in with open arms. The officiating crew has become a surrogate family and that’s meant the world to me. My derby husband Kill Nye has become one of my best friends within or without derby. Keiran Duncan and Darth Bling became by mentors. I’ve gotten to help grow some great officials in Knitty, Doesn’t Matter, Jersey, Xtra Chris P, and too many others to name. We’re all in this together and we help make world-class roller derby happen. Team Officials is why I stick around. I grew up in the Boy Scouts of America and it instilled me with an appreciation for being part of something bigger than myself.  Being part of Rose City Rollers gives me that same sense of pride and personal satisfaction that what I’m doing matters. At its core, RCR provides a nurturing space for people to grow and empower themselves through this wonderful and weird game. Being an official gives me a unique opportunity to watch skaters evolve from Bambi On Ice at their first scrimmage to competing for spots on Wheels of Justice. I’ve seen people become leaders, teachers, mentors, organizers, and arbiters. My involvement with RCR means the development of not just our skaters, but also the officiating crew, our announcers, our event staff, and our administrative staff. This goes beyond teaching people to skate or helping someone understand how to construct a track. This organization has helped people, myself included, become better versions of themselves. I can’t ask for a greater sense of satisfaction than being part of an organization that changes lives. Don’t get intimidated by the size of RCR. I started my derby career with Connecticut Roller Derby (formerly CT Roller Girls) and we had about 50 people between skaters, officials, and administrative personnel. I came to Rose City and was frankly overwhelmed that this league was literally ten times larger than CTRD. We’re a big organization, but that doesn’t mean you don’t have a place. We want you here, and we want help you in. Don’t be afraid to ask, and we’ll help you find where you need to be. I think that sometimes it is difficult for some volunteers to remember that other folks have lives, hobbies, careers, and friends/family outside the Hangar. Not everyone can volunteer an insane amount of hours, and that’s okay. There’s a place in RCR for people who’ve organized their lives around roller derby and those who do it for fun. I think we do a darn fine job of supporting our fellow volunteers, but that doesn’t mean we’re perfect. Find some time to love and appreciate your fellow volunteers more, and reinforce the positive culture we have here. Things go haywire once we start to rest on our laurels. Stay vigilant about honest and open communication, and assume good intent. We’ve got a great thing going here, and it takes every last one of us to keep our culture positive and welcoming for new and old members alike.